The latest issue of the FLYER is published, by our very own Lavon Hatcher. Check out these two videos from the 2016 Beers Regatta! 2 - This video was put together by Clint Hodges and showcases some of the crazy stunts that were going on while the racing was cancelled due to high winds. What an extreme boat the Y-Flyer is! 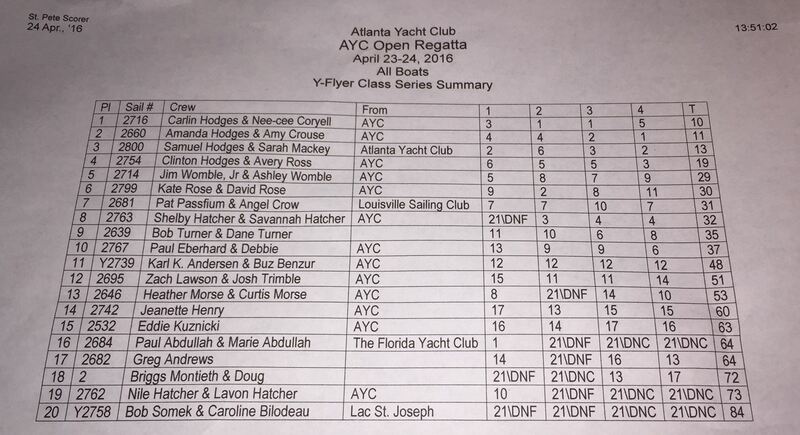 Great turnout for the AYC Open, see the final scores for the Y-Fleet below. The event is set to take place on October 12th – 14th 2012. 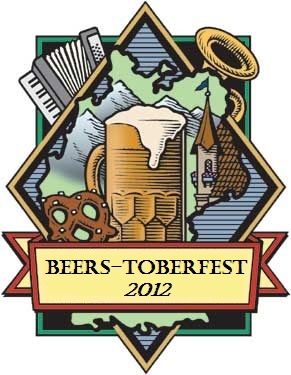 Taking on an Octoberfest theme, this year will surely knock your lederhosen off! Hosting this year’s Gilbert Beers Memorial Regatta are brother and sister, Clint and Kate Hodges. Feel free to contact Clint or Kate if you’re interested in borrowing a boat, getting involved, or any other concerns/questions about this year’s event! Pat Passafiume and crew Patrick found the wind streaks and dodged the holes to win the 56th annual Gilbert Beers Memorial Regatta. Sailing at the Atlanta Yacht Club on Lake Allatoona, the team scored a second, third and a first place finish to take home the winner’s trophy. In the Blue fleet the brother and sister team of Russ Hanley and Christa Ross completed a 2, 1, 1 series to nail the Blue Fleet trophy. "Not bad since I haven’t sailed a Y in 19 years" said Hanley. This was the first time they had ever sailed together. At times the team was sailing as high as second place in the Gold Fleet. The brother sister chatter could be heard all over the race course and I was told it echoed as well all over the course during the Friday afternoon golf tournament. The Smitty Smithfield Memorial Trophy given to the highest placing Atlanta Yacht Club skipper was won by Shelby Hatcher who with crew Doug Kinser placed second overall. Dave Sherlock shook off defeats in the first two races to come back in the final race with a third place finish. For his effort he was awarded the coveted Spike Wilson "For all the Marbles" trophy. Eighteen gold fleet skippers and three blue fleet skippers competed in the Regatta. The winds were blowing out of the North West at about 6 mph for the start of the first race. The lake was three feet above full pool requiring the race committee to tie balloons to a submerged reef marker in the middle of the race course. With temperatures in the mid 70's, Carl Owens, Race Committee Chairman, set up a Modified Olympic course. Although there were dead air holes, the winds remained fairly steady for the first and second races. A small squall line passed though about 3 pm bringing light rain and stronger winds. Race 3 had to be shortened as the wind began to slack off about 4:30 pm. Fortunately the forecasted 80% chance of rain never materialized. All three races were sailed on Saturday. A Sunday morning race was started but shortly the wind went flat, three horns blew, the race was abandon and the regatta was considered complete. The coveted "For all the Marbles" Trophy will be a perpetual trophy given each year in memory of Spike Wilson. Spike grew up racing Y-Flyer sailboats at AYC and won the Beers Trophy in 1962 at age 25. Spike never let a bad race discourage him as his next race would be for "all the marbles". He was one of those "spark plugs" who ignited enthusiasm for Y-Flyer sailing and was instrumental in promoting the Y-Flyer class. Regatta Chairmen Craig Wagner and Rusty Hanley, that "Git-R- Done" team, grilled up some fine steaks for the Saturday night dinner. You can really attract a crowd when you have a huge cooler of free beer donated by Spike Wilsons daughter Suzanne. Patrick Passafiume, Pat Passafiume's son and crew on his dads winning Y-Flyer, treated the crowd to a funny funny stand-up comedy show that was great entertainment. It seems he majored in stand-up comedy but graduated with a degree in economics from the University of Louisville.